Looking at a map, you may have noticed that our route so far hasn’t exactly been direct. From the ferry arriving in Hachinohe, we headed north, before going south again. But after leaving Towada, we started making good progress down right side of Japan towards Sendai. As the lake is in a volcanic crater, it is surrounded by steep mountains on all sides. Unfortunately this meant we were immediately into another climb when we left the campsite on day 7. This in itself wasn’t too bad as we were well rested and feeling good. But the road through the forest was infested with bugs of all descriptions that were more than able to keep up with us at our climbing speed. We probably used more energy with our hands swatting away the insects than we did with our legs for the first hour. We reached the crater rim and started down a long descent on Route 454 then 21 towards Takko town. Before we knew it we’d clocked 30km to get the morning off to a good start. We had some rain on the way but we had definitely benefited from a rest day and were getting into the rhythm of cycling. 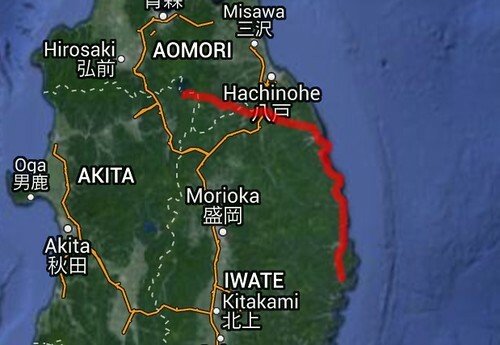 We joined busy Route 4 which is a main road running north – south down the centre of Japan. We entered Iwate Prefecture when we turned off onto a smaller road running through the hills towards the coastline. We stopped for lunch at an unknown village where we found a fruit and veg stall with a toilet block next door. We set up our stove in the carpark outside when the woman from the veggie stall came outside to usher us over to the table outside her place. After we’d eaten, we popped in and bought a couple of peaches which seem to be a speciality of the area. As we started to leave the woman ran after us with a bag of boiled eggs to give us. Perfect for an afternoon snack later on. We hoped we’d make it to the coast and clock up our first 100km day, but as the afternoon continued the rain returned. On the map, we spotted a ‘michi no eki’ at Oono with an attached onsen that looked to be a good place to call it for the day. We pulled in and headed straight to the onsen to soak and relax for a while before thinking about dinner. We took advantage of the communal tatami area inside to hang out, charge our batteries and then make a couple of Skype calls. 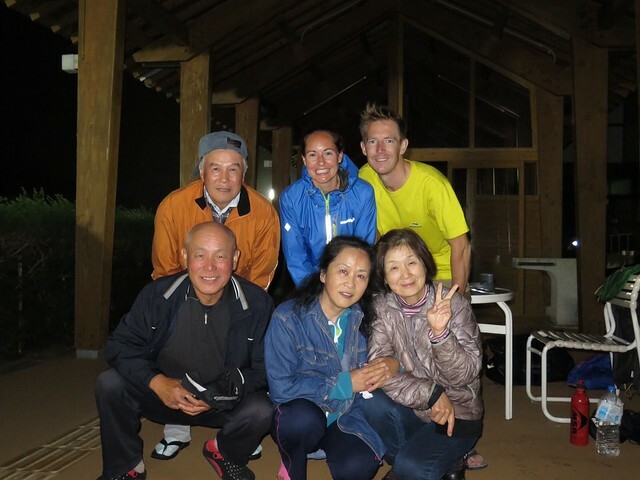 Dinner was cooked sheltering from the rain at the michi no eki where we were joined by a group of 4 retirees who were travelling and car camping their way around northern Japan. They were super friendly and kept the Japanese kindness coming. They gave us some veggies to go in our dinner, some sushi and yet more peaches. As well as some corn and riceballs the next morning as we left. 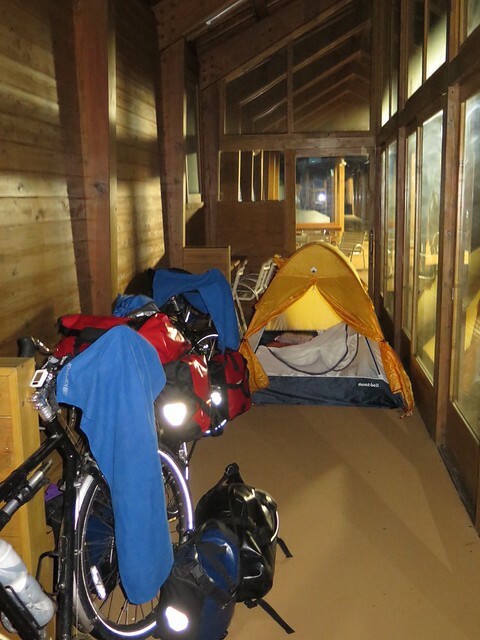 We had a dry night despite the pouring rain thanks to a wooden shelter in which we pitched our tent and put all our panniers. The rain hammering down on the roof was loud, but we mostly slept through the night. 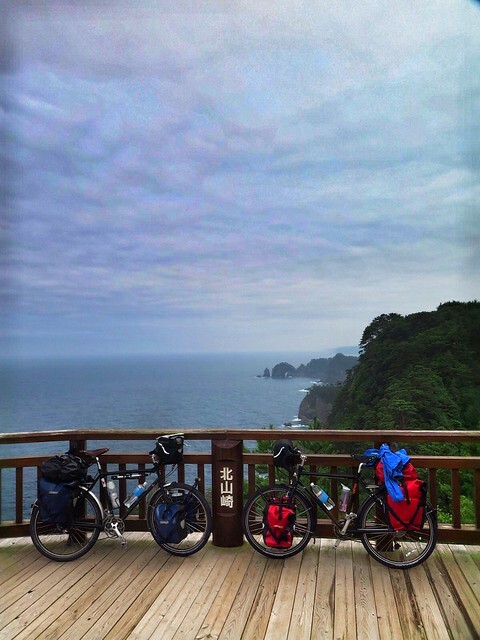 The rain started to mellow out on day 8 once we reached the Iwate coastline at Kuji. 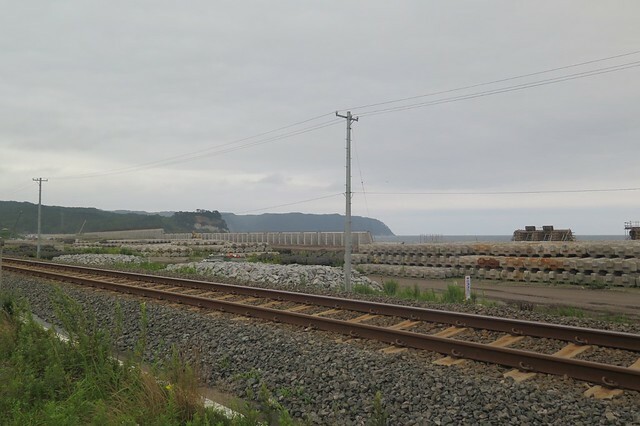 For the next 5 days or so we’ll be following this coast of Iwate and Miyagi prefectures which was struck by the 2011 tsunami. 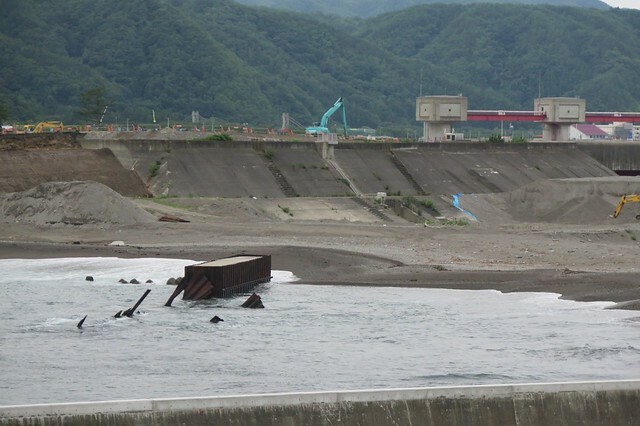 The evidence is still very much apparent with lots and lots of new construction of sea defences as well as large areas of bare earth where it seems buildings once stood. Along the road there are signs showing the areas that were flooded which really brought it home just how high up the hillsides the flood waters rose. We followed coastal Route 45 south, occasionally skipping onto minor roads to get closer to the cliffs and scenery. The bays and coves were steep sided, which meant lots of ups and downs but generally very pleasant cycling. We stopped for lunch at Kita Yamazaki, part of the Rikuchu Kaigan National Park. The cliffs are hundreds of feet high, dropping vertically down to the Pacific Ocean. A decent backdrop for our lunch of jam sandwiches and rice balls. Being part of a national park, there were of course the essential gift shops and restaurants serving the regional favourites. 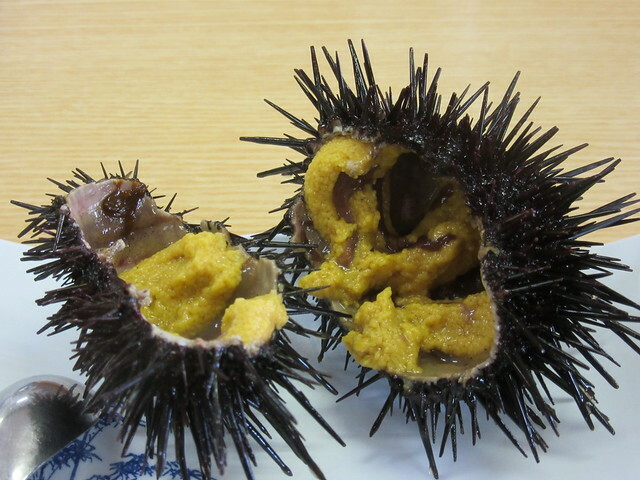 Clare finished off lunch with a sea urchin, raw from the shell and I had an ice cream, eaten with a spoon made of dried seaweed. Very local. 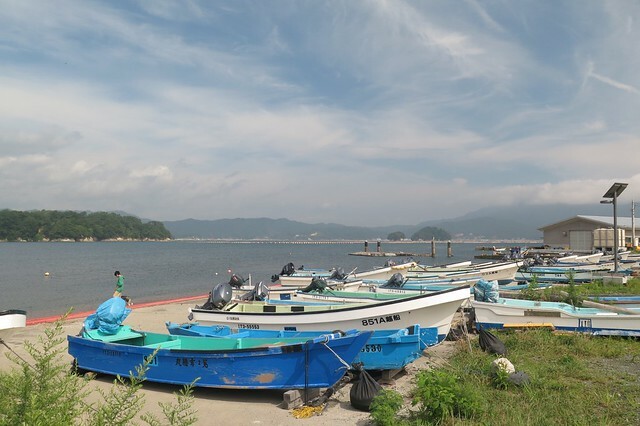 We got further into tsunami territory through the afternoon and stopped for the day at Omoto. 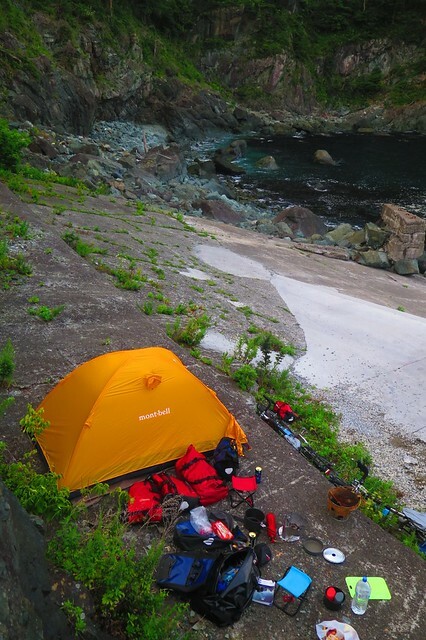 We found a spot to camp at the entrance to the harbour and pitched our tent on the remains of a concrete pier. Once the tide went out we saw metal containers and other debris that was strewn against the coastline. Day 9 was a tough one. The weather was hot and the climbs continued. It just seemed to be taking a while to get anywhere. 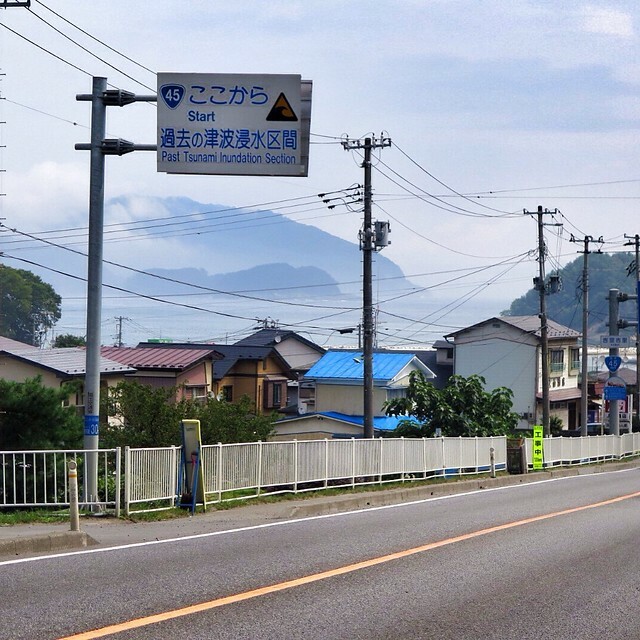 30km got us down close to the town of Miyako where it became apparent we weren’t going to be covering a huge distance. We decided on a long mid-morning stop at Jodogohama beach, another spot in the Rikuchu Kaigan park. From the signs, it looked a lot more beautiful than reality. We were hoping for white sand and Okinawa-esque blue sea, but we found a crowded stony beach and a roped off swimming area patrolled by lifeguards in rubber dinghys. It was a good rest though after a draining morning. We stuck in Miyako for lunch, and to shop for food and some other camping supplies. The rest of the afternoon’s riding continued to be tough. We were still on Route 45 and hoping that we’d be riding over terrain which looked from the map to be flatter. It was, but we had a building headwind to contend with. We decided on the town of Yamada as a place to stop for the night. The michi no eki didn’t present any viable camping spots so we headed up towards an autocampsite on a small rocky peninsula just to the south of town. As we were climbing up the 12% ish road to site, the owner passed us on his struggling moped and shouted some encouragement. We’d already spent our budget for the day and decided to go a little over to pay for a campsite as we both needed a shower and a good night’s sleep. 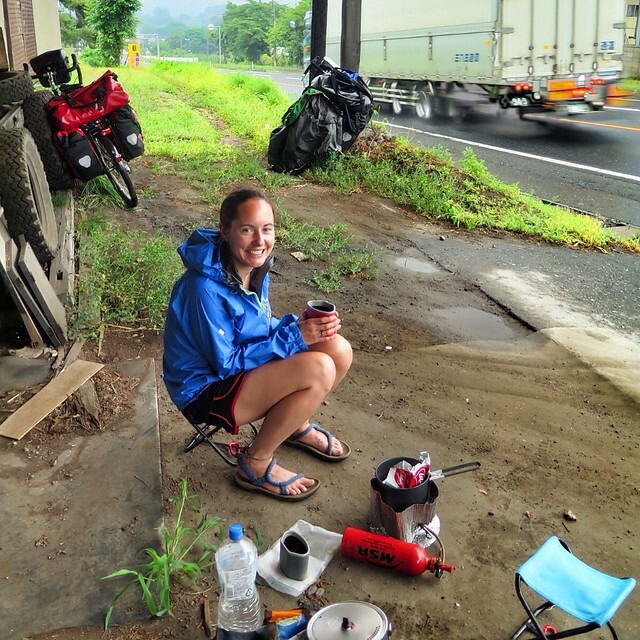 Being an autocampsite, the price was going to be over 2,000 yen, as they wanted to charge us as if we had motor bikes. We, very un-Japanesely, commented that it was quite expensive just for a two bicycles and I think the owner took pity on us. He said he’d cut the price in half and then as he was showing us the sites facilities, gave us two cold beers from the fridge. Suddenly the day was salvaged. 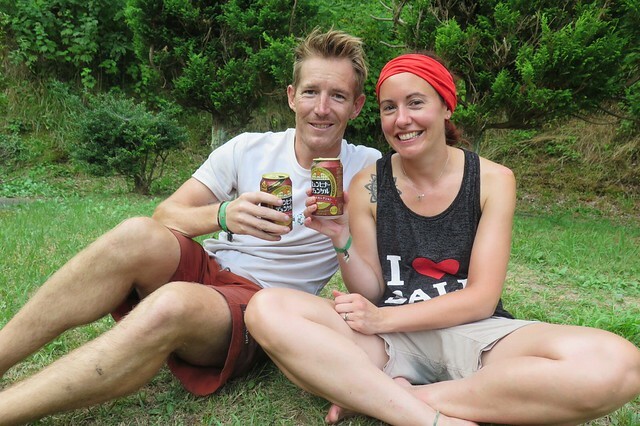 We cleaned up, cooked dinner in the site’s kitchen, planned the route for the next day and slept soundly. Hello!! we just had a chance to read all your posts. 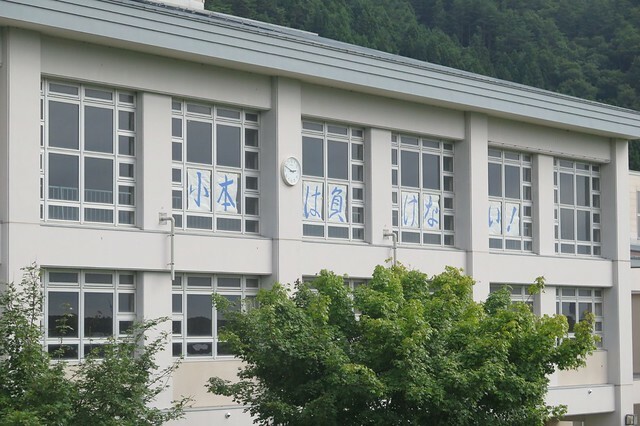 Great stuff …..Yes, don’t we know just how tough Japan can be what with the heat and the hills. We also saw your seats from the 100 yen shop!! Fabulous, John got one too just before we headed to Korea. Eating that raw sea urchin seemed very impressive to us Clare…..!! Now we’re happy being “resting cycle-tourists” and it felt so good to reach this lovely place. But it’s also bloody hot and humid here, perfect excuse for us to do nothing…….If we haven’t done it already we’ll put a link to your blog on ours. Thanks for reading, and enjoy your stopover for a well deserved break! Wonderful photos so far guys! What an adventure you’re having!